Exercisers are often concerned about the internal safety hazards that come along with chilly sweat sessions, but there is surprisingly little to worry about. Simply suiting up appropriately with enough layers made of moisture-wicking fabrics keeps the body at a healthy temperature and functioning the same way it would in any other workout environment. 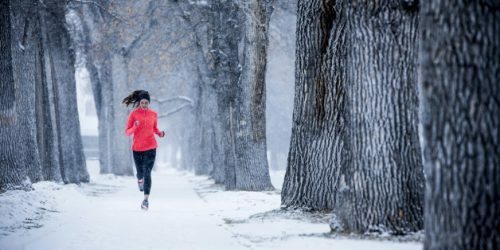 Sure, a slippery moment on an icy running path could lead to injury, but circumstantial (and potentially clumsy) moments aside, exercising outside during the wintertime actually boasts benefits that may not be achieved as efficiently elsewhere. If you can pull yourself away from that cozy seat in front of the fireplace, you’ll reap these seven bonus benefits of sweating it out in the cold weather — and you might even learn to love it. As the body works harder to regulate its core temperature among the elements, you’ll burn a few more calories during your wintry workout compared to one conducted indoors. While the calorie burn varies with each person’s body mass and the extremity of the temperature, it can be a nice morale booster (especially around the food-focused holidays) to get more out of your sweat session in this regard. Cold weather also makes the heart work harder to distribute blood throughout the body. For an unhealthy heart that struggles to manage the additional stress, this process can exacerbate illness and injury. But a regular exerciser with cardiovascular endurance can make their heart muscle even stronger with these cold-weather sessions, better preparing the body for more strenuous workouts in the future — not to mention other non-exercise stresses in life. Staying hydrated is one of the most important factors in minimizing the dangers of cold-weather workouts. The body continues to sweat, but that sweat evaporates more quickly into the chilly, dry air, making it seem as though the body is losing less water. Drinking water before, during and after cold-weather workouts helps maintain peak performance, protect the body from injury and stay warm from start to finish. Don’t wait to feel thirsty to hydrate! You’ll build a tolerance for the freezing elements. It can feel downright painful to force yourself out into the elements for the first workout of the winter season, but rest assured that over time, it does get easier. According to chief coach of the New York Road Runners organization John Honerkamp, it’s important to adjust your expectations as you acclimate rather than push for your typical, temperate-weather performance. Pay particular attention to the amount of effort you’re putting forth rather than hitting certain time, distance or other performance goals, and try to just enjoy the process. You’ll remember the importance of warm-up and cool-down routines. Proper warm-up and cool-down movements are crucial to keeping the body in top fitness shape, but they become even more important when it’s cold outside. Keeping the body loose, limber and warm for a chilly workout can help prevent painful twists, sprains, tears and other injuries. Winter workouts will encourage you to become a pro when it comes to full warm-up and cool-down routines, the former to keep your internal body temperature elevated, and the latter to reduce unnecessary tightness inspired by the chill in the air. You’ll get a dose of vitamin D.
Sure, it may be cold, but that doesn’t mean the extra sun exposure won’t supply you with the same critical nutrients it does throughout the warmer parts of the year. The relative benefit also feels more substantial in the wintertime since the amount of natural light is already so restricted. Just remember to wear your sunscreen (yes, even when it’s freezing) after your skin is exposed for 10 to 15 minutes. You’ll feel happier and more energized. Cold-weather exercise also has the ability to boost one’s mood, thanks to the lack of humidity (which creates that heavy air feeling in the summer months) and the stimulating aspect of the chill. As the body works harder to stay warm, the amount of endorphins produced also increases, leaving you with a stronger sense of happiness and lightness following a a workout in the cold.